Somewhere on a back road between Detroit Lakes and Hendrum. TRAVELING NORTHWEST TOWARD the Red River Valley from Detroit Lakes last Thursday morning, I thought I was mentally prepared for the vastness, the flatness that define this area. I am, after all, a native of the southwestern Minnesota prairie. And I’ve been to Fargo-Moorhead, which is tabletop flat. Trucks hauling crops are the most common vehicles on roads in these parts this time of year. But this route was different. This nearly 1.5 hour drive took Randy and me off the interstate and onto back county roads and state highways as we aimed toward Hendrum in Norman County. At times we drove for endless miles without sighting another vehicle. It’s unsettling to feel such isolation, to know that you are miles between towns, that the distance between farm places stretches farther and farther. 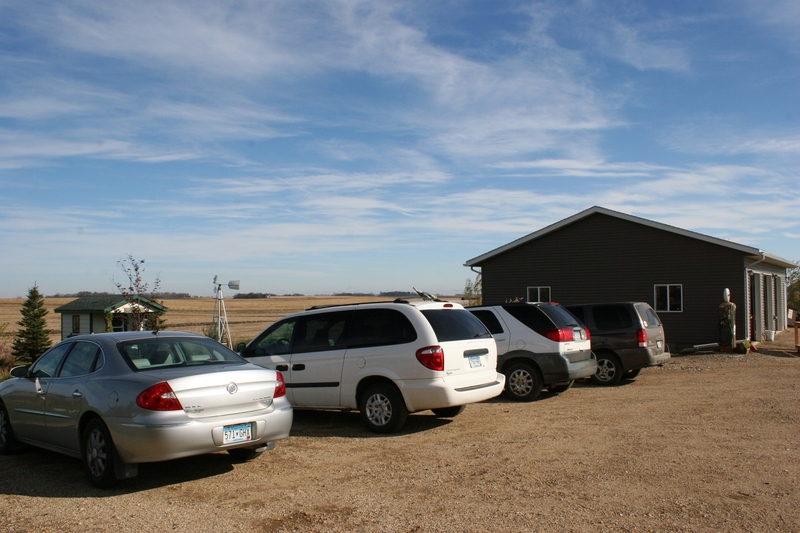 Our route took us through several small towns, including Borup just 20 miles southeast of Hendrum. Yet, I tried to make the best of this drive to visit friends who once lived in Faribault. A job relocated the family of seven to this town of 300 some 30 miles north of Fargo-Moorhead along U.S. Highway 75. Mountains of sugar beets are prevalent in this region. As we headed toward Hendrum, Randy and I, both Minnesota farm-raised, observed the progress of harvest—seemingly slowed by too much rain. In places, mud from farm equipment stamped the roadway and signs warned of slippery surfaces. Acres and acres of corn remain to be harvested. Muddy conditions, however, apparently don’t stop the picking of sugar beets, a major crop in this region. Our friends’ oldest son works at a sugar beet plant as he saves money to attend a college in Washington, D.C. I can only imagine the cultural shock of moving from remote northwestern Minnesota to our nation’s capital. Clusters of grain bins are common in this agricultural area. This is an area that truly is Red River Valley flat, that seems to an outsider rather desolate. But, framed in a positive way, it is a peaceful place. Wide. Spacious. Uncluttered by traffic and housing developments. It is a land marked by grain bins and by small town elevators, which can be seen for miles—seven miles once, Randy noted. It is a land marked, too, by rectangles of stacked bales rising like barges along our route toward the Red River. Here the land and sky seem endless. Here agriculture anchors the economy. Although I couldn’t live here given the flatness, the remoteness, I can appreciate that others call this place home. TELL ME: Have you been to the Red River Valley of Minnesota or neighboring North Dakota? RELATED: Check out this story (click here) by Bob Collins of Minnesota Public Radio about a Sugar Beet Museum in Minnesota. CHECK BACK as I take you into Hendrum. You won’t want to miss the humor of Hendrum. THE FARMER IN THE HOODED sweatshirt and jeans motions from atop the combine to the trucker across the field. He’s ready to unload just picked corn into the grain truck late on a Sunday morning near Sleepy Eye. Scenes like this repeat throughout southern Minnesota as the fall harvest is underway. I embrace this season as much for the memories as for the sights, sounds and smells. The farm-raised girl in me emerges, vicariously experiencing the harvest through a camera lens. I feel this intense desire to return to the land every autumn. 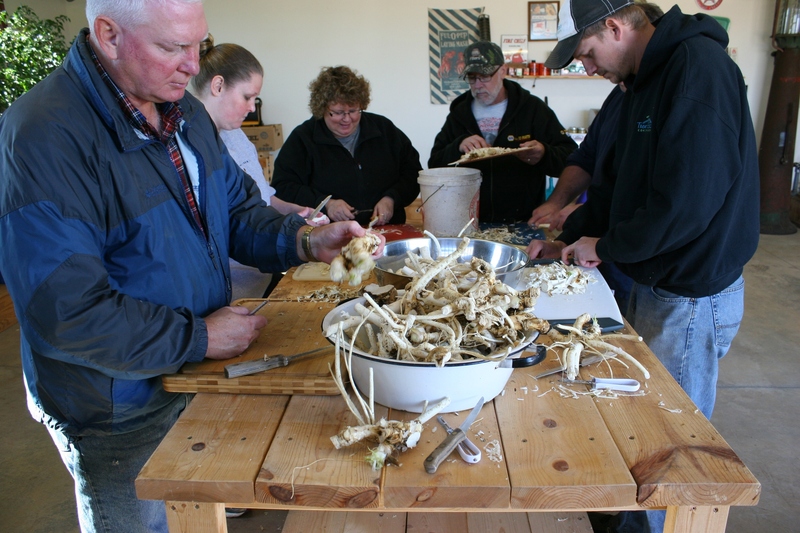 And last weekend an annual horseradish making party with extended family took me back to my home county of Redwood. Along the route there and back, I documented the harvest. It is the closest I come now to being part of the process of bringing in the corn and soybeans. I miss the closeness to the earth that comes with growing up on a farm. Sure things have changed a lot in the nearly 45 years since I left rural Redwood County. But the imprint of harvest remains, still strong. You can take the girl from the land. But you can’t take the land from the girl. IN THE SEASON of autumn, farm memories draw me back to the land. A vintage Gleaner combine harvests a cornfield along LeSueur County Road 13 near Lake Jefferson. Near historic Marysburg in LeSueur County. and mammoth bins awaiting the yield. Following a tractor pulling a 1970s era gravity box along LeSueur County Road 13. Visiting at the intersection of LeSueur County roads 13 and 16.
and stalled in conversation at a rural intersection. Cattle graze along 241st Avenue, just off LeSueur County Road 13. A harvested field glistens with puddled rainwater and mud. Too much rain has slowed the harvest for farmers in southern Minnesota. They will be working long days and nights to catch up and get the crop in before the snow flies. Enjoying a beautiful autumn Sunday afternoon along Waseca County Road 22.
who follows country roads in the season of autumn. FYI: I shot these images in Rice, LeSueur and Waseca counties during a Sunday afternoon, October 22, drive with my husband. Check back for more photos from that drive. A steam engine tractor plows a field. 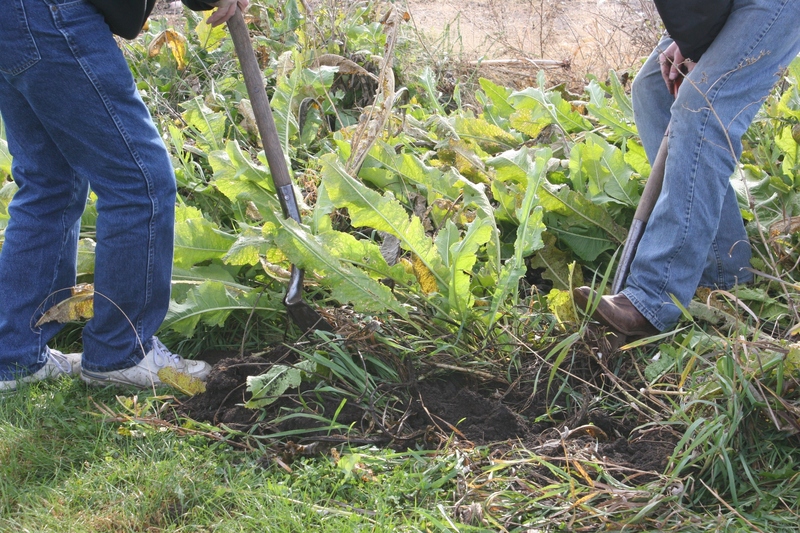 The men standing on the plow guide the blades to the proper plowing depth via levers. AS SEASONS SHIFT from the growing days of summer to the harvest days of autumn here in Minnesota, aged tractors, threshing machines and other vintage agricultural equipment roll out of storage for annual threshing and steam and gas engine shows. The engineers at the helm of the steam engine tractor concentrate on guiding it along the field. On display under plexiglass: a replica 1920s threshing scene crafted by David Terry. It’s a common scene this clustering of folks around vintage tractors. These events mark a celebration of the past, a preservation of history, the remembering of a way of life, a focus on the labor intensive efforts of long ago farming. Here retired farmers lean against tractor wheels, men guide massive steam engines, kids learn and an honoring of times past prevails. After finishing a plowing pass in the field, the steam engine tractor heads back to the other end. Sunday afternoon I embraced Minnesota’s agricultural history at the annual Labor Day weekend Rice County Steam & Gas Engines Show in rural Dundas. I didn’t view every aspect of the event, but enough to once again feel a deep appreciation and respect for my rural heritage. John Deeres were the featured tractor this year. I love meeting friendly and photogenic vendors who are willing to be photographed. Flea market vendors offer merchandise ranging from glassware to tools to clothing and lots more, including many agricultural related items. With camera in hand, I roamed part of the grounds looking for photo ops that would present a personal and unique perspective of the show. From the flea market to the music shed to the rows of tractors and the vintage playground, I found my photos. There is so much heart and soul here and an obvious love of all things related to farming of bygone decades. These girls rode their vintage banana seat bikes from Northfield. And, yes, there parents were at the show. Carefree dancing and twirling as only kids will do. Even the playground equipment is vintage. I’m especially delighted that so many kids attend. Kids pedaling banana seat bikes. Kids twirling to the old-time music of the Czech Area Concertina Club. Kids steering tractors. Kids swinging on heavy horse swings now banned from most playgrounds. Some families, like the Pinc family, bring multiple tractors in multiple brands. Generations spanning infants to elders come to this show ground along Minnesota State Highway 3 under a sky that holds the haze of autumn, of a sun that still blazes heat in the afternoon, of a land that yields its bounty to the harvesters. Here on these acres, memories rise like a prayer of thanksgiving as summer eases into autumn. TELL ME: Do you attend these types of historic farming shows? If yes, I’d like to hear more. PLEASE CHECK back for additional photo rich posts as I continue my series from the Rice County Steam & Gas Engines Show. A farm site between Kenyon and Faribault. ALONG GRAVEL ROADS and across fields, farm machinery kicked up dust, shrouding rural southeastern Minnesota in pockets of hazy grey. Dust sometimes trailed plumes behind tractors. 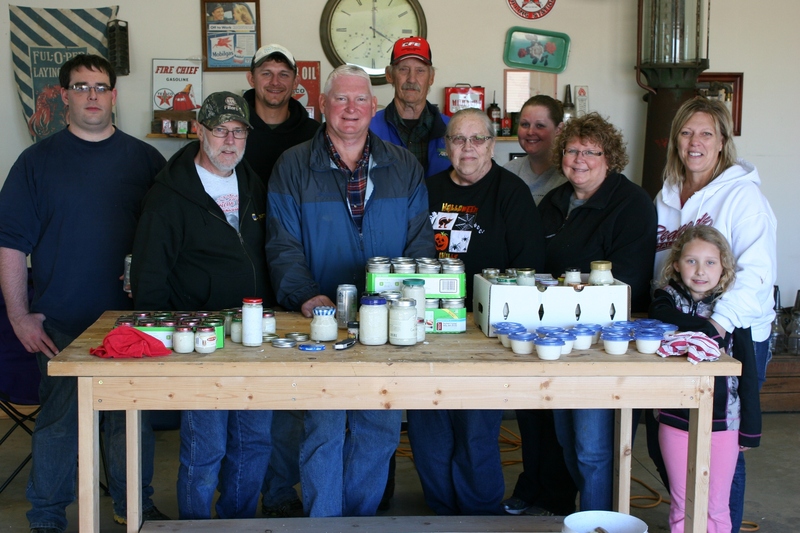 All American Co-op in Stewartville Saturday afternoon. In small towns, tractors pulling grain wagons and trucks loaded with corn or soybeans waited at local elevators. Bees wings (chaff from corn cobs) accumulate along Main Street in Hayfield. And bees wings drifted, tinting Main Street and sidewalks red. Near Root River County Park in Olmsted County. In township after township after township, I observed farmers gathering in the crops and working the land on Saturday. A good drying day. Sunshine and crisp temps. Perfect to finish the harvest. A cluster of bins by Hayfield. A day trip drive this time of year requires patience as combines, trucks and tractors clog roadways, slowing traffic. But that’s OK. Sometimes we need to creep along, to simply appreciate this land and the farmers who plant, tend and gather in the crops. Somewhere between Morgan and New Ulm, in the middle of prime Minnesota farm land early Saturday evening. HARVEST. That word holds the seasons of a farmer’s hope. A partially-harvest cornfield between New Ulm and Morgan. From spring planting to summer growth to autumn ripening, a farmer focuses on the outcome—a yield that brims with golden corn and soybeans. Harvest equipment sits in a cornfield west of St. Peter. Through months of looking toward the skies, of weathering too much or too little rainfall, of watching heat shimmer waves across fields, of tending and waiting, a farmer anticipates this season of harvest. Driving west on Minnesota State Highway 99 toward Le Center. On a day trip Saturday from the southeastern to the southwestern side of Minnesota—through Rice, Le Sueur, Blue Earth, Nicollet, Brown and Redwood counties and back—I observed the harvest. Minimal on the eastern side, which has been flooded with too much recent rainfall, but in full swing in the counties of Brown and Redwood. Combining beans near New Ulm. Farmers worked the land, dust enveloping combines. A red grain truck jolts color into a field near New Ulm. North of Belview, trucks await the harvest. Parked outside the elevator in Morgan. Farming communities like Morgan are busy with harvest. This time of year, motorists need to be watchful of slow-moving farm equipment. Harvest started west of St. Peter. The landscape crawled with tractors and combines and trucks, farmers at the wheels, guiding the crops toward harvest. A harvested field against a farm site backdrop of white. And I observed it all. No longer an intimate part of this process as I once was so many decades ago on my Redwood County childhood farm, I am still connected to this season by the memories that trace deep within me. Harvest still holds me in hope. 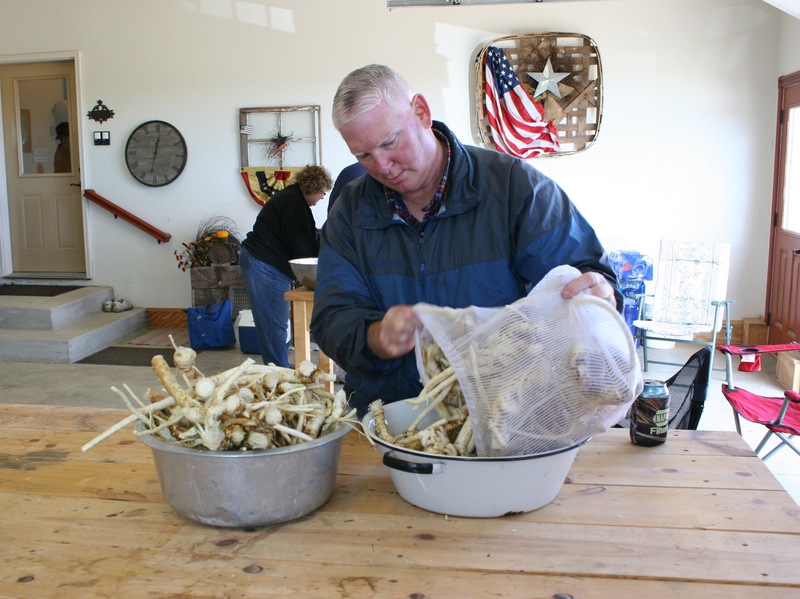 Freshly-processed horseradish from southwestern Minnesota. THE CREAMY SAUCE LINGERS on my tongue. Then, zip, my nostrils burn with the zing of stinging horseradish. My eyes water. And I wonder why I eat this stuff. I like spicy. I like hot. Not jalapeno with too many seeds hot. But horseradish hot I can handle in small doses. It’s part of my DNA. 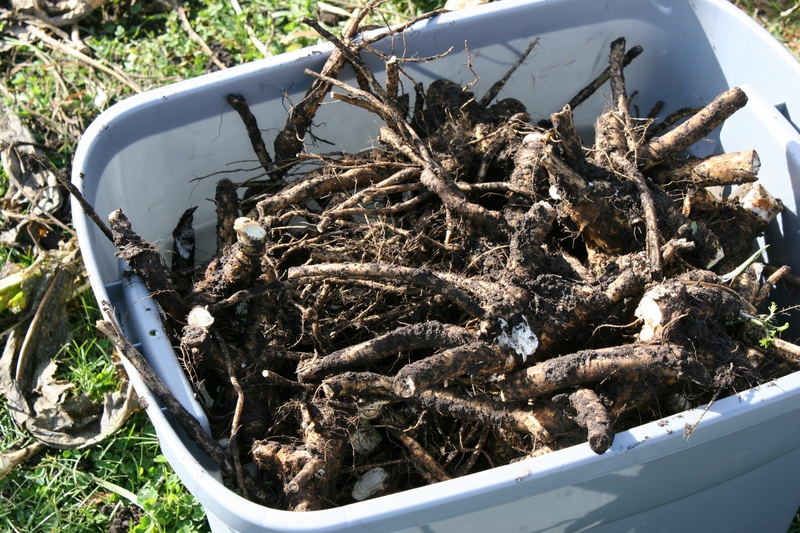 STEP ONE: Digging the horseradish, which grows like carrots underground. 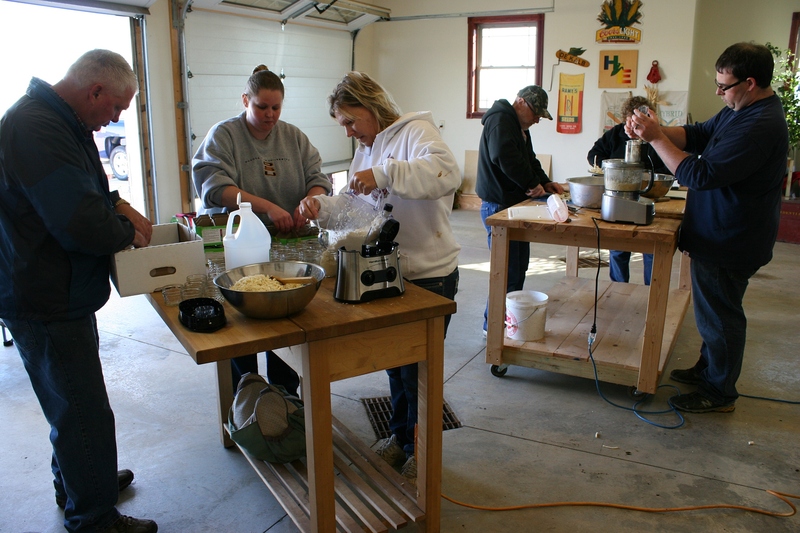 We arrive mid-morning on a cool and windy Saturday in late October to process the horseradish. 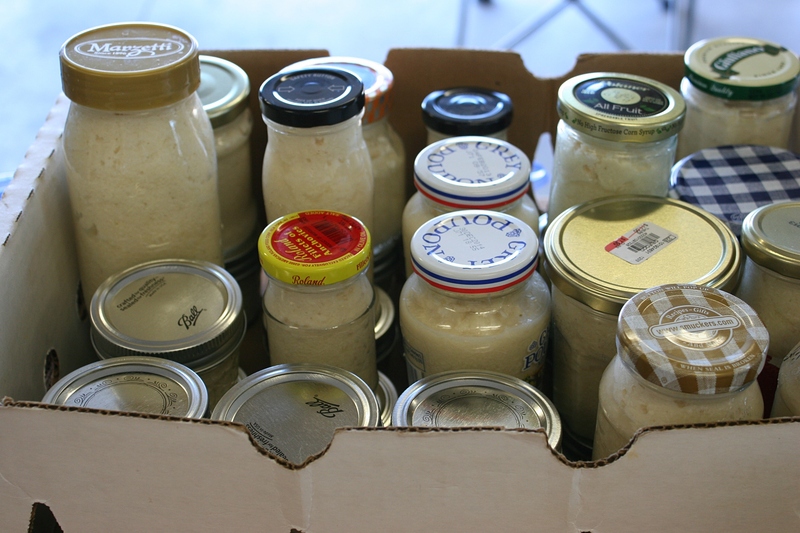 For years, until his death in 2003, my dad made horseradish. You don’t really make horseradish. Rather you process the roots into a creamy white sauce. 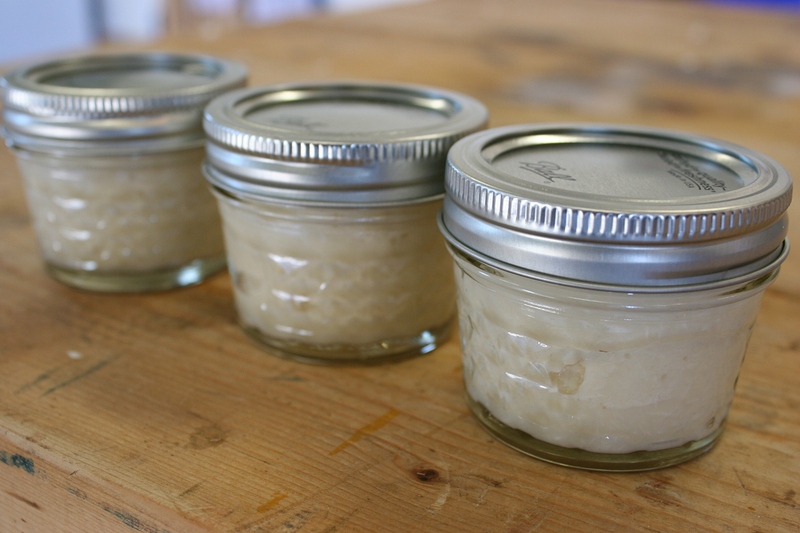 Horseradish preserved in vinegar. STEP TWO: Scrubbing away the dirt. 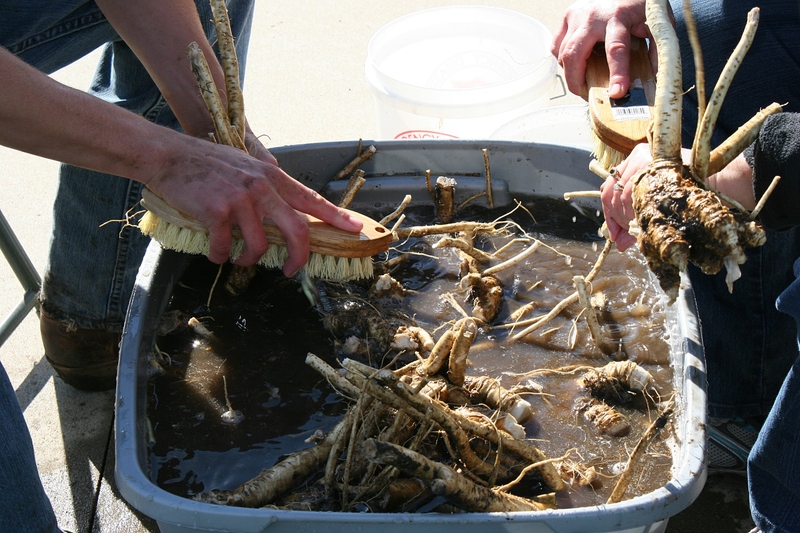 STEP THREE: The horseradish is placed in laundry bags and washed in the washing machine. 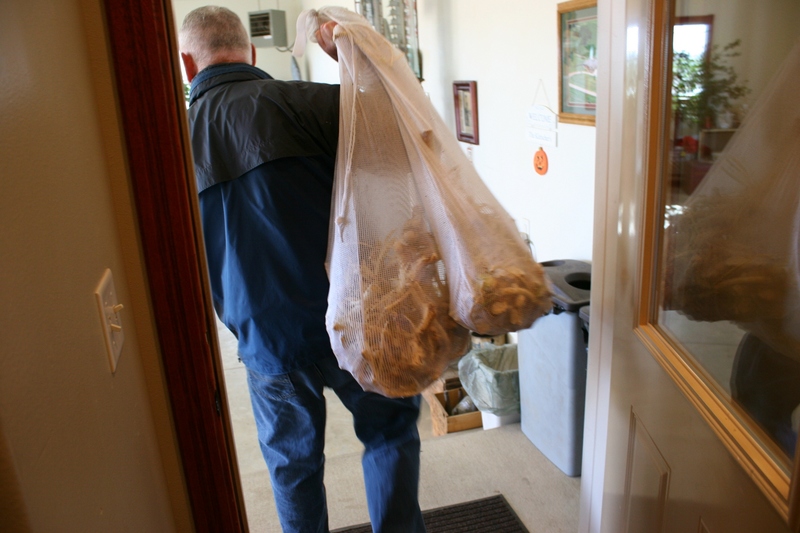 Here my brother carries the just-washed horseradish to the work area in his garage. The roots are now ready to be peeled with a knife and/or potato peeler. Every bit of brown must be removed to get a creamy white sauce. My brother empties the second laundry bag. It’s not an easy task. 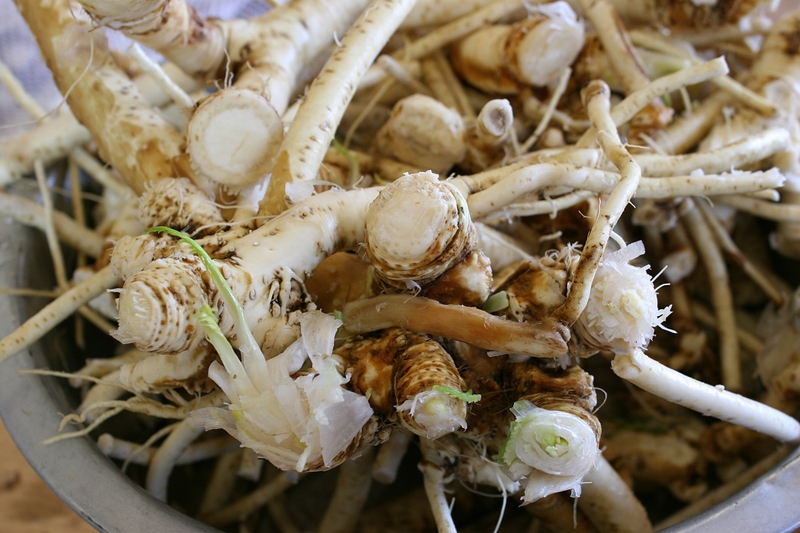 Creating a horseradish condiment requires a full day of digging, scrubbing, washing, peeling, washing, cutting, shredding, blending, pouring into jars and, finally, planting the peelings for new growth. 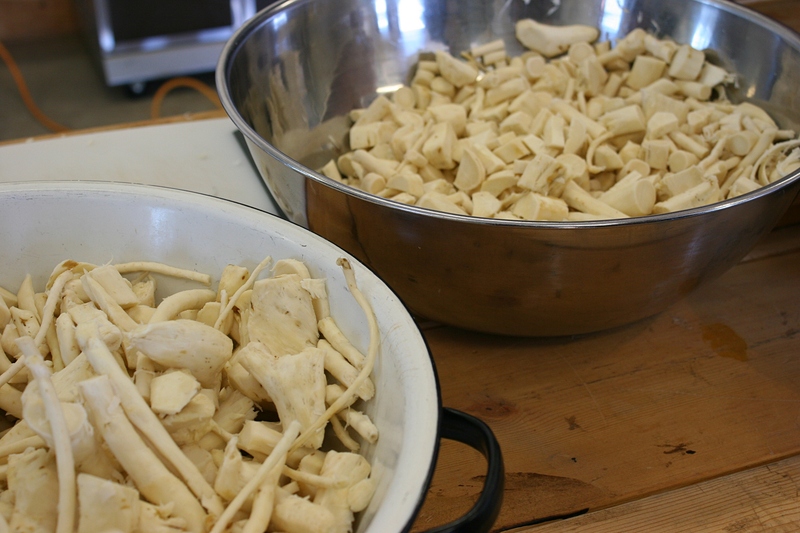 STEPS FOUR & FIVE: Family members peel horseradish before it’s washed for a second time. STEP SIX: Using knives, we slice the horseradish into chunks. My sister Lanae and her husband, Dale, whom Dad mentored in all things horseradish, pushed for continuing the family horseradish tradition. And so, on a Saturday each autumn, we gather at my middle brother and sister-in-law’s rural southwestern Minnesota acreage to honor our dad with this seasonal rite. 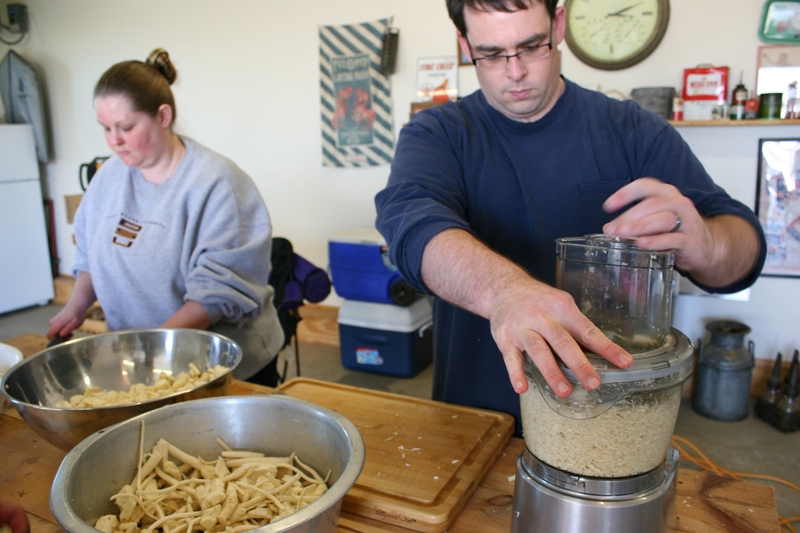 STEP SEVEN: My niece’s husband refines the horseradish in a food processor. Sometimes the potent fumes are more than workers can handle. STEP EIGHT: Blending horseradish and vinegar. Peelings and conversation fly. 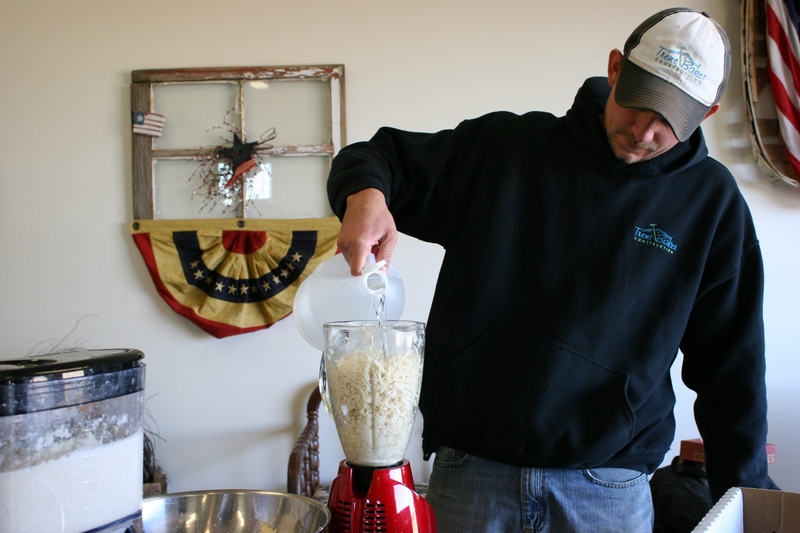 Washing machine, food processor and blender whir. Eyes water. Heads turn. And the beer stays in the fridge until the last knife is stashed away. But not always. An overview of most of the crew nearing the end of a long work day. 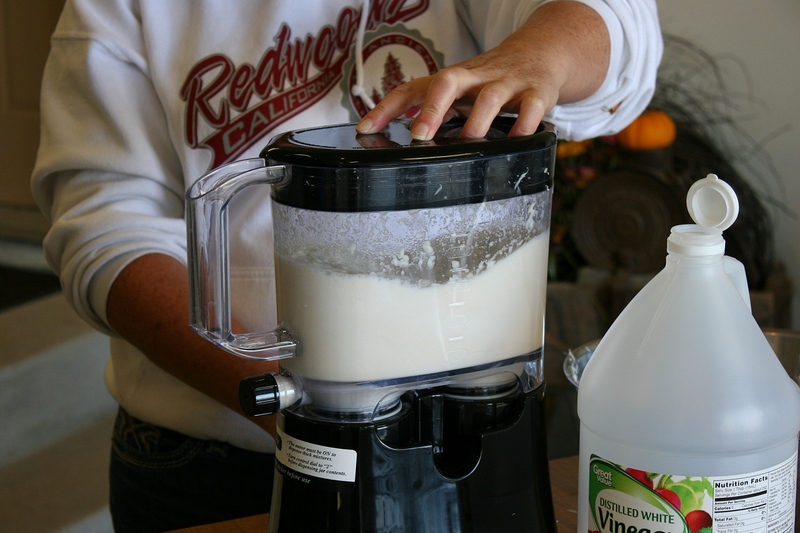 My nephew adds vinegar (it’s by guess, not measurement) to the horseradish before blending. It’s a day that’s as much about horseradish as about family. A coming together. Building memories. Remembering Dad. 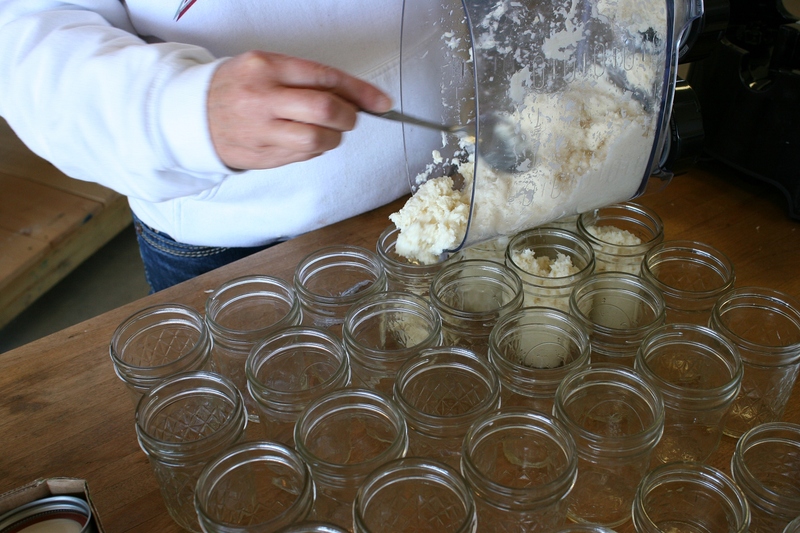 STEP TEN, OPTIONAL: Counting the filled jars. This year a new supervisor—my sister-in-law’s mother from Iowa—replaced my mom, who is no longer able to watch over the crew and count the jars. Still, Mom asked how many jars we filled. No one counted. We told her 88. Life changes. We age. Loved ones die. But we can honor their legacy, their love—for my family via harvesting the horseradish. Enter your email address to follow Minnesota Prairie Roots and receive notifications of new posts by email.